Join the discussion on our forums! Come discuss Bearshark over in our dedicated Bearshark discussion topic. 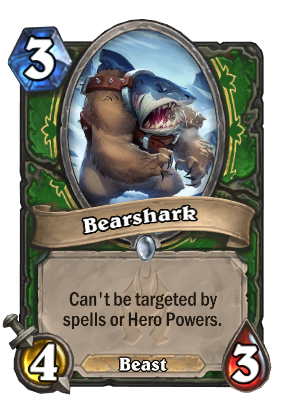 I like this minion also the concept of mixing bear with a shark. It has okay stats for 3 mana and nice effect. Why is this a beast? Its undead like Unearthed Raptor and Fossilized Devilsaur which weren't. That's a very arbitrary reason... its a mangled shark's head strapped onto the decapitated body of bear, and it gets to keep the beast tag? I admit it. I was dead wrong about this card. I really didn't think it would see play. Now it's replaced Rat Pack in so many decks. The real MVP of the actual meta game! Singlehandly wins a lot of games against Priest and Mage if you can buff/adapt him. The best card and card art in KFT. I guess technically even Ultimate Infestation can't kill it. Seriously Blizzard, i got like 4 copies of this card on 8 packs. This card is bad. There are way better cards you can play for 3 mana, a 3 health minion doesn't cut it. A 2 drop can trade into it. What are way better cards? This is a decent minion, a Beast, and an Elusive minion, meaning that no spell can target it. Here’s the deal with Bearshark. It has only 3 health. By Turn 4 or so, I want a minion to hit with Houndmaster or can trade into multiple enemy minions to eatablish board control. Bearshark can’t do that. Also, there isn’t room for a 4/3 Beast. It doesn’t do much. The only card I can see this replacing is Rat Pack, and that card is so much better because of its sticky Deathrattle. Well, why not both? Against spell-heavy you use Bearshark, against minion-heavy you use Rat Pack. What kind of sound will this majestic abomination create once it is dropped on the battlefield? The gold version of this card is horrifying!